Enjoy hearty meals with the rich, authentic flavour of Knorr Homestyle Vegetable Stock. 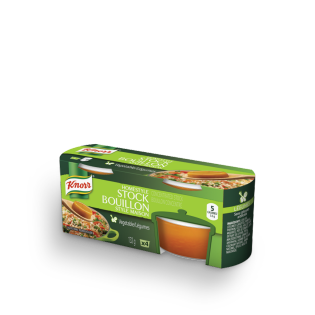 Knorr Homestyle Stock is an easy way to make a dish stand out. Use it in your favourite recipes or to enhance the flavour of soups, stews, sauces, rice, vegetables and potatoes. Water, salt, vegetables (carrot, leek, pepper, celery), modified palm oil, tomato paste, sugar, yeast extract, parsley, xanthan gum, carob bean gum, natural colour, natural flavour, spices, mustard oil. Simply dissolve Knorr Homestyle Stock in boiling water to enhance your soups, chowders, rice, risotto, and veggie dishes. Or add it directly to your ingredients when making stews, sauces, and gravies. This Web site is intended for Canadian consumers of products and services of Unilever Canada Inc. This website is not intended for consumers outside Canada.